So, seeing as I’ve just been paid from work and I’ve just gotten over the 50k mark in nanowrimo. I completed the purchase of three domain names. We are looking to launch one of them early next year, (prob around easter) full of all kinds of goodies etc all to do with the series. Well I do have to have a goal, and at present this is it. 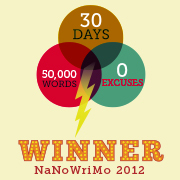 So, yeah I managed to get the 50k done, and I am glad that I had nano to focus on. Been a very stressful weekend to be honest and few days to be honest. And I didn’t blog about it before, in case well you know. Employers spy on everything nowadays. My other half was suspended on friday from work, pending an investigation into ticket irregularities. To cut a long story short, he’s a bus driver and he takes kids to and from school. He’s been in the job for 16 years and has never had a bad thing happen to him. Till Friday, when he had some inspectors on. Kids are kids and they love to bunk on… but they don’t realize that without a ticket and then them lying to the ticket inspector saying they paid the driver, that they can get the driver into lots of trouble and of course the driver could lose his job. Well it was very stressful, it wasn’t his fault, but thankfully at present he still has his job. Nanowriomo has helped me deal with this over the weekend. Instead of driving me up the wall, I’ve focused on the story, wrote a lot and kept myself sane. So a big thank you. I am in the process of calming down. We’re okay, we will be okay. It has just been very, very hard. I’ve managed to write some more today, I do want to finish this novel. 🙂 So onwards. I’ll keep you posted. And I have no words left in me to write tonight…. So, I have finished writing for today. A total of 7,620 words written, the most I’ve ever done. I think realizing yesterday that the end of the month was nigh sort of got my wriggle on. I am at 46, 269 🙂 YEY!!! I also had the pleasure of meeting some great people in the wrimo chat room to spur me on. Fingers crossed I will be over that finish line tomorrow. You never know!! I can hope, can’t I?